The first and only chat session I have ever had on the internet. Sometimes when I’m being sarcastic, it comes out sounding like I hate everyone in the world. And that upsets me. It really, really does. So instead of confusing people with a long, sad rant about how I have to dumb down everything I say in case one of the half dozen easily-offended morons who I come in contact with occasionally end up reading this (If you’re reading this, you aren’t one of them), I’m going to copy and paste the first and only chat session I have ever had with anyone, ever. I find much of my existence intolerable. To me, phone calls are harassment, people who spit on the sidewalk are terrorists, and hot weather is some kind of ecological scumfuckery I haven’t fully figured out yet because it’s too hot to think and I want to fire off angry emails at Cecily Tynan. So it is with me. Every time there is not something going on that causes me horrible discomfort, I am pleasantly surprised and actually quite happy. But now, since when I logged into Yahoo this morning my settings were set to accept random chat sessions from total strangers, I find myself with my head down, weeping silently. flirty.flirts154:‎ heya there , cutie! flirty.flirts154:‎ im not stalking hehe I just like talking to people online ;) esp thru webcam… do u webcam? Me:‎ Are you the nurse? flirty.flirts154:‎ ah ok :) are u on any dating sites? Me:‎ No, I’m 87 years old. flirty.flirts154:‎ I wanted to join adult friend finder but they charge to much! so I use crushcams instead, have you heard of it? Me:‎ I can’t even operate my coffee maker. Me:‎ Is that you on my television doing the weather? Why is it going to rain? I have to go to the pharmacy. Me:‎ If my diaper gets wet I’m calling the library. Me:‎ I sleep in a chair. Are you the nurse? Me:‎ I remember you from the television. You’re that young weather girl. Shouldn’t you be in school? Me:‎ I have milk in my refrigerator older than you. Me:‎ But the refrigerator is broken. Me:‎ Stay the hell out of my refrigerator. Me:‎ My pants smell like bread dough. flirty.flirts154:‎ take care , cutie! thank u for msging wit me!! Me:‎ I have to go feed the pigeons. If it rains I’ll get polio. All of my friends are wonderful. It's hard to be objective about my family, but I like to think they're swell folks. My co-workers are all great. I can't think of a single person at my job who I don't have genuine respect for. Rarely do I encounter a true jerk in everyday life, so it's always a bit of a shock to me. I just don't see them very often. It's like seeing a giraffe. I always express a bit of wonder. "Wow, that guy was a jerk!" "Did you see that jerk?" "That bar was full of jerks!" When I come in contact with a real jerk, it's not even very unpleasant. It's just somewhere between alarming and amusing, like an unexpected spice in my food. Remember when we all lived in a van in that Pathmark parking lot? When we used to light shopping carts on fire and leave them in the middle of Oregon Avenue? When we drank gallon jugs of Bankers Club Gin for breakfast and got in food fights at the Chinese Buffet every day at lunch? By dinner we'd be so drunk we would just stand out front of the Pizza Hut yelling "STUFFED CRUST!!!" over and over until they fed us free food? When we devolved into chimpanzees and beat passers-by with rolls of wrapping paper we stole from the dollar store? When we dressed in the skins of wild animals and painted our faces with the blood of our enemies? When we chanted the names of the Elder Gods until they rose from the sea and forced us to breed with jellyfish? When our poisonous spawn ran wild throughout the land and sprayed their caustic venom at anything with a vertebrae and the streets ran red with blood? When the black sky itself would open it's drooling mouth and laugh with joy at the things we did? I really miss the Weekly World News. I used to look forward to going to the grocery store. I'd wait in line, pick up a copy and start a conversation with a total stranger about whatever was on the cover. Of course, none of us are strangers when faced with the news that the Gates of Hell are open and history's worst villains are coming to kill us all. Or the news that an artichoke heart transplant can actually save your life. I remember being in line one time reading a story about a preacher who spontaneously exploded during a sermon. I turned to an old lady next to me and said "Why? Why do things like this have to happen?" She just shook her head and muttered "It's a damn shame." It's moments like these that made the publication so special. It touched our lives. I remember the shock and feeling of hopelessness and loss the first time I noticed it missing from the checkout lines at the Pathmark in 2007. I think America died a little that day. 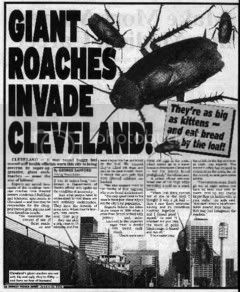 The Weekly World News gave us all something to fear. Together, as a country. I think it's awful that we don't have anything like that anymore. In the checkout line at Super Fresh the other day, an elderly Asian guy in front of me was buying a big box of chicken. As he approached the cashier, he turned to me with a menacing grin and said in a loud voice "IT'S A HOLIDAAAAAAAY!" and then began laughing maniacally, like a cartoon villain. This is my new greeting for any and all holidays. So when you see it, don't run away. You will want to, but don't. Just don't. Have you seen these new commercials with the big creepy burger king guy sneaking into peoples bedrooms and waking them up with one of those compressed air horns? I can't even begin to describe the massive heart attack I would have. What possible motivation could they have for making these ads? They're not even trying to sell burgers anymore. They just want to scare the living hell out of people. I'm afraid to close my eyes at all anymore. Do you think if I asked nicely the burger king guy would stop terrorizing people so I can sleep again? Okay, here's something I see quite often, and it's unfortunate because it makes me literally convulse with nausea every time. A human being walks out their front door, and begins blowing their nose onto the sidewalk. Without a tissue. Just blowing the contents of their nostrils onto the sidewalk. There is no way I can think of to sufficiently describe how horrifying this is to me. I'd rather rabid elephants with tentacles and antennae take over the world, enslave humanity, and force us all to watch Dr. Phil for hours a day than see people blow streams of snot all over the sidewalks of the city. What is going on inside your house that makes you have to come outside and do this in front of me? Is it a dust bowl in there? After 8 hours a day working in an environment where people try not to spread infectuous diseases, I walk outside to see people painting the sidewalks with their mucous. When did this become something people do? Ever since I was a kid I've taken tissues with me when I left the house. I think most people did. I don't ever remember waiting for the school bus, and seeing another kid emptying his nose all over the street. When did it become acceptable, even common to do such a thing? Did some popular artist write a song about it? Is it an environmental thing? Because if it is, hankies work too. They're washable, dryable and re-usable. There are literally hundreds of other options out there besides just spraying it all over the ground. Think about it. You manage to hold in your poop! You don't just squat on the sidewalk and crap all over it whenever the urge arises, do you? If you can manage that, there's no reason you can't wait until you find a tissue or a handkerchief. You can do it, humanity. I have faith in you. These stories are true. Every word. Names have not been changed. Not everything here happened in South Philly, because I sometimes go elsewhere.